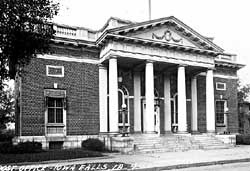 The Iowa Falls Post Office (1914) is a Neo-Classical building, built under the administration of William McAdoo, Secretary of the Treasury, with Oscar Wendroth, Supervising Architect. The style was influenced by the architecture of the 1893 Colombian Exposition in Chicago and was considered to be most appropriate for public buildings. The high stone foundation, broad entrance stairs, and pedimented portico are all important elements of the style. While federal buildings in larger towns were often constructed of stone, those in smaller communities utilized brick. Neo-Classical in design, it is constructed of dark red brick laid in English cross bond, creating an interesting pattern. The building rests on a high foundation of North Carolina granite. The symmetrical façade features a pedimented portico with four monumental Doric columns 30 inches in diameter and 22 feet high. Three tall round arched openings are located at the back of the portico. The main entrance is in the middle. Above the entrance is a beautiful Della Robia type swag. The interior of the building has retained a high level of integrity. The 13 foot by 35 foot lobby retains its white oak woodwork, marble-terrazo floor and vaulted ceiling. The round arched openings of the exterior are continued on the interior with multi-pane windows allowing light to pass from one space to another. An interesting landscape element in the south lawn are the peonies that were origninally planted by Abigail Estes Foster, from whom the U.S. Government purchased the land in 1909. The US Post Office--Iowa Falls is located at 401 Main St. and is open to the public 9:00am to 5:00pm.